President Humala Ollanta’s new prime minister – his seventh in less than four years – won a vote of confidence in Congress two weeks ago, but odds are that his government won’t be much more popular than those of his six predecessors. Pedro Cateriano, who had served for three years as Humala’s Minister of Defense, was sworn in on April 2, after the Congress turned against Prime Minister Ana Jara over a spy scandal involving Chile. 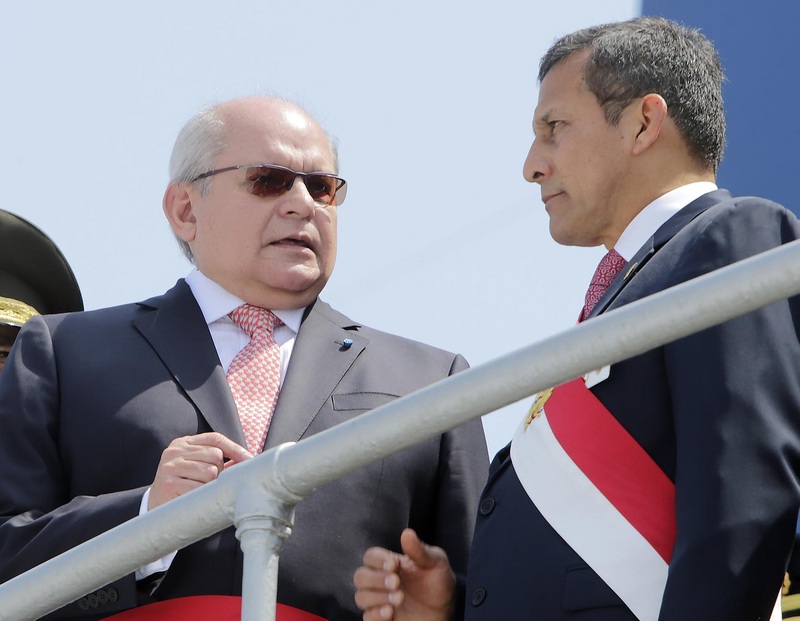 (The Chileans, whose intelligence service allegedly recruited several Peruvian Marines in 2005-2012, ended the crisis last week after providing what the Peruvians said were “satisfactory explanations” and pledges to “cease old practices” that have been negative for bilateral relations.) Fulfilling constitutional requirements, Cateriano and his cabinet presented their program to the Congress on April 28 for the vote of confidence, in which there were 73 votes in favor, 10 against, and 39 abstentions. The government team reiterated a commitment to reduce inequality, remove obstacles to investment, and improve education, health care, and other social services. Like Humala’s first four years in office, his remaining 14 months (he can’t run again) appear likely to feature a mix of successes and stubborn challenges. Peru’s economy is doing better than most others in Latin America – 2.4 percent growth in 2014 and slightly more than 3 percent projected for this year – but a drop in Chinese demand for Peruvian copper has depressed prices 6.4 percent last year and more than 13 percent this. (Metals account for 60 percent of Peru’s export earnings.) This has been a drag on growth and caused the trade deficit to rise to $2.5 billion in 2014 and even higher in 2015. Humala has increased spending, and poverty reduction programs have lifted about a million Peruvians out of “extreme poverty” since he took office, while inflation remains low – about 3 percent a year. The decline in metals earnings has fueled internal tensions as the government has attempted increasingly aggressive policies to open new areas to mining and accelerate mining projects in the pipeline. The mobilization of military troops last week to quell protests over a new $1.4 billion mining project in the south, which have already resulted in the death of three police and several civilians, poses a real problem. Humala is by no means unique in suffering a contradiction between basically sound economic performance and chronic inability to sustain domestic political support. His predecessors have suffered variations of the same malady, rooted in part in the country’s notorious lack of a functioning political party system. But with seven different prime ministers, his government has looked particularly disorganized. He has arguably been a competent manager but an ineffective leader – muddling through rather than executing a vision for a better future for Peru. In the runup to winning his vote of confidence, Cateriano showed strong, consultative political skills in garnering the support of most former Peruvian Presidents, but overcoming the administration’s lame-duck status amidst growing conflict over metals extraction and the beginning of campaigning for the 2016 election will be a constant challenge. And this government’s experience, like that of its predecessors, suggests that his successor will also face powerful headwinds in a persistently fragmented political landscape.